This new home page is currently only available if you have 100 or fewer sites in your Webmaster Tools account (either verified or unverified). We’re working on making it available to all accounts in the future. If you have more than 100 sites, you can see site health information at the top of the Dashboard for each of your sites. Have we detected malware on the site? Have any important pages been removed via our URL removal tool? Are any of your important pages blocked from crawling in robots.txt? You can click on any of these items to get more details about what we detected on your site. If the site health icon and the “Check site health” link don’t appear next to a site, it means that we didn’t detect any of these issues on that site (congratulations!). A word about “important pages:” as you know, you can get a comprehensive list of all URLs that have been removed by going to Site configuration > Crawler access > Remove URL; and you can see all the URLs that we couldn’t crawl because of robots.txt by going to Diagnostics > Crawl errors > Restricted by robots.txt. But since webmasters often block or remove content on purpose, we only wanted to indicate a potential site health issue if we think you may have blocked or removed a page you didn’t mean to, which is why we’re focusing on “important pages.” Right now we’re looking at the number of clicks pages get (which you can see in Your site on the web > Search queries) to determine importance, and we may incorporate other factors in the future as our site health checks evolve. Obviously these three issues—malware, removed URLs, and blocked URLs—aren’t the only things that can make a website “unhealthy;” in the future we’re hoping to expand the checks we use to determine a site’s health, and of course there’s no substitute for your own good judgment and knowledge of what’s going on with your site. But we hope that these changes make it easier for you to quickly spot major problems with your sites without having to dig down into all the data and reports. After you’ve resolved any site health issues we’ve flagged, it will usually take several days for the warning to disappear from your Webmaster Tools account, since we have to recrawl the site, see the changes you’ve made, and then process that information through our Web Search and Webmaster Tools pipelines. If you continue to see a site health warning for that site after a week or so, the issue may not have been resolved. Feel free to ask for help tracking it down in our Webmaster Help Forum... and let us know what you think! 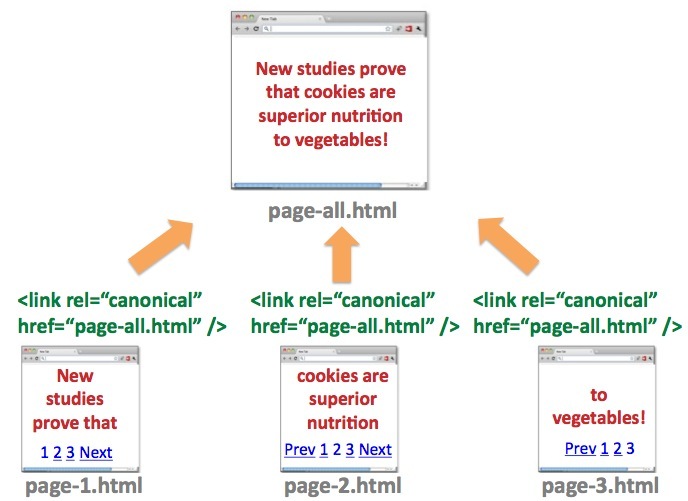 The relationship between component URLs in a series can now be indicated to Google through rel=”next” and rel=”prev”. There’s an exception to the rel=”prev” and rel=”next” implementation: If, alongside your series of content, you also offer users a view-all page, or if you’re considering a view-all page, please see our post on View-all in search results for more information. 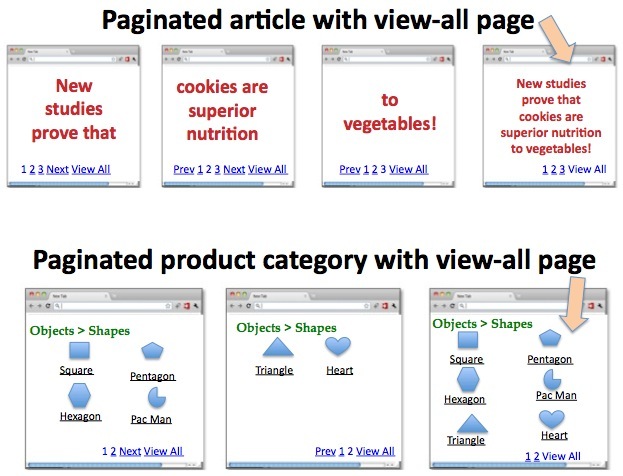 Because view-all pages are most commonly preferred by searchers, we do our best to surface this version when appropriate in results rather than a component page (component pages are more likely to surface with rel=”next” and rel=”prev”). 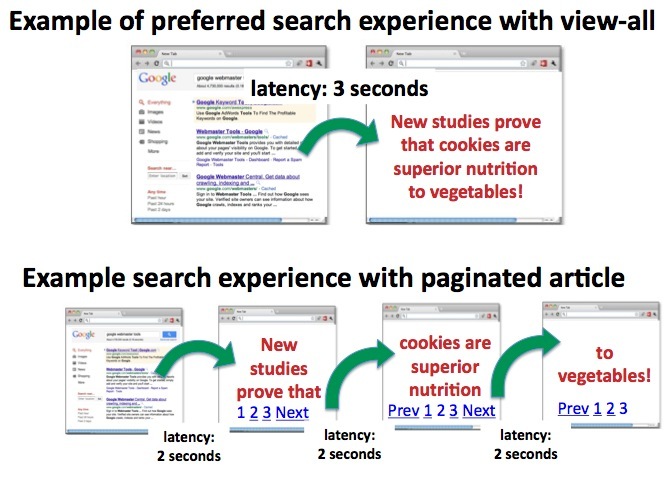 If you don’t have a view-all page or you’d like to override Google returning a view-all page, you can use rel="next" and rel="prev" as described in this post. For information on paginated configurations that include a view-all page, please see our post on View-all in search results. Leave whatever you have exactly as-is. Paginated content exists throughout the web and we’ll continue to strive to give searchers the best result, regardless of the page’s rel=”next”/rel=”prev” HTML markup—or lack thereof. If you have a view-all page, or are considering a view-all page, see our post on View-all in search results. Hint to Google the relationship between the component URLs of your series with rel=”next” and rel=”prev”. This helps us more accurately index your content and serve to users the most relevant page (commonly the first page). Implementation details below. The first page only contains rel=”next” and no rel=”prev” markup. 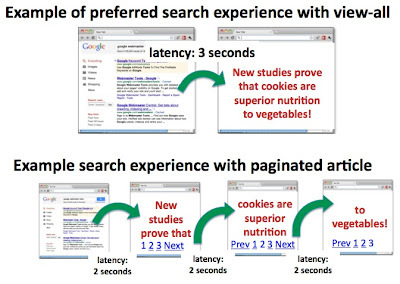 Pages two to the second-to-last page should be doubly-linked with both rel=”next” and rel=”prev” markup. The last page only contains markup for rel=”prev”, not rel=”next”. rel=”next” and rel=”prev” values can be either relative or absolute URLs (as allowed by the <link> tag). And, if you include a <base> link in your document, relative paths will resolve according to the base URL. rel=”next” and rel=”prev” only need to be declared within the <head> section, not within the document <body>. We allow rel=”previous” as a syntactic variant of rel=”prev” links. 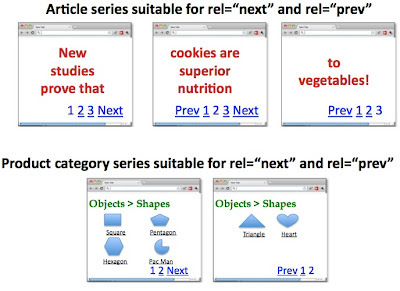 rel=”prev” and rel=”next” act as hints to Google, not absolute directives. 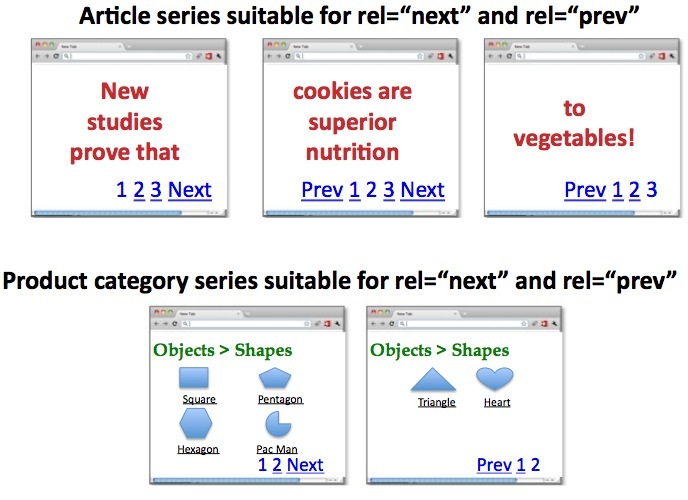 When implemented incorrectly, such as omitting an expected rel="prev" or rel="next" designation in the series, we'll continue to index the page(s), and rely on our own heuristics to understand your content. More information can be found in our Help Center, or join the conversation in our Webmaster Help Forum! If your site isn't appearing in Google search results, or it's performing more poorly than it once did (and you believe that it does not violate our Webmaster Guidelines), you can ask Google to reconsider your site. Over time, we’ve worked to improve the reconsideration process for webmasters. A couple of years ago, in addition to confirming that we had received the request, we started sending a second message to webmasters confirming that we had processed their request. This was a huge step for webmasters who were anxiously awaiting results. Since then, we’ve received feedback that webmasters wanted to know the outcome of their requests. Earlier this year, we started experimenting with sending more detailed reconsideration request responses and the feedback we’ve gotten has been very positive! Now, if your site is affected by a manual spam action, we may let you know if we were able to revoke that manual action based on your reconsideration request. Or, we could tell you if your site is still in violation of our guidelines. This might be a discouraging thing to hear, but once you know that there is still a problem, it will help you diagnose the issue. If your site is not actually affected by any manual action (this is the most common scenario), we may let you know that as well. Perhaps your site isn’t being ranked highly by our algorithms, in which case our systems will respond to improvements on the site as changes are made, without your needing to submit a reconsideration request. Or maybe your site has access issues that are preventing Googlebot from crawling and indexing it. For more help debugging ranking issues, read our article about why a site may not be showing up in Google search results. We’ve made a lot of progress on making the entire reconsideration request process more transparent. We aren’t able to reply to individual requests with specific feedback, but now many webmasters will be able to find out if their site has been affected by a manual action and they’ll know the outcome of the reconsideration review. In an ideal world, Google could be completely transparent about how every part of our rankings work. However, we have to maintain a delicate balance: trying to give as much information to webmasters as we can without letting spammers probe how to do more harm to users. We're happy that Google has set the standard on tools, transparency, and communication with site owners, but we'll keep looking for ways to do even better. , recipes, reviews, video, and events, and most recently music. Before you install a software application, users might want to check out what others think about it, and how much it costs. We are pleased to announce that starting today, you’ll be able to get this information right in search results. Here's an example of what an application snippet looks like. You can see application snippets from several marketplaces and review sites, including Android Market, Apple iTunes, and CNET. For information on how to add app markup on your site, please refer to our Webmaster central article and send any questions to our discussion help forum. 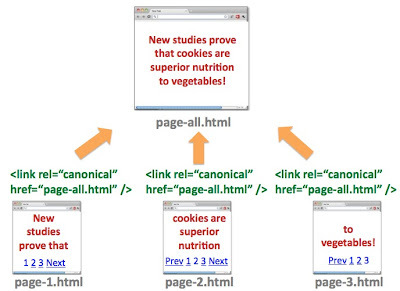 Rich snippets help users determine more quickly if a particular web page has the information they're interested in. We've previously introduced rich snippets for shopping, recipes, reviews, video, and events, and most recently music. We can’t recommend this enough: reuse the same template for all language versions, and always try to keep the HTML of your template simple. Keeping the HTML code the same for all languages has its advantages when it comes to maintenance. Hacking around with the HTML code for each language to fix bugs doesn’t scale–keep your page code as clean as possible and deal with any styling issues in the CSS. To name just one benefit of clean code: most translation tools will parse out the translatable content strings from the HTML document and that job is made much easier when the HTML is well-structured and valid. If your design relies on text playing nicely with fixed-size elements, then translating your text might wreak havoc. For example, your left-hand side navigation text is likely to translate into much longer strings of text in several languages–check out the difference in string lengths between some English and Dutch language navigation for the same content. Be prepared for navigation titles that might wrap onto more than one line by figuring out your line height to accommodate this (also worth considering when you create your navigation text in English in the first place). Variable word lengths cause particular issues in form labels and controls. If your form layout displays labels on the left and fields on the right, for example, longer text strings can flow over into two lines, whereas shorter text strings do not seem associated with their form input fields–both scenarios ruin the design and impede the readability of the form. Also consider the extra styling you’ll need for right-to-left (RTL) layouts (more on that later). For these reasons we design forms with labels above fields, for easy readability and styling that will translate well across languages. Also avoid fixed-height columns–if you’re attempting to neaten up your layout with box backgrounds that match in height, chances are when your text is translated, the text will overrun areas that were only tall enough to contain your English content. Think about whether the UI elements you’re planning to use in your design will work when there is more or less text–for instance, horizontal vs. vertical tabs. Our own day-to-day usage has shown the following editors to currently provide decent solutions for bidirectional editing: particularly Coda, and also Dreamweaver, IntelliJ IDEA and JEditX. When designing for RTL languages you can build most of the support you need into the core CSS and use the directional attribute of the html element (for backwards compatibility) in combination with a class on the body element. As always, keeping all styles in one core stylesheet makes for better maintainability. Some key styling issues to watch out for: any elements floated right will need to be floated left and vice versa; extra padding or margin widths applied to one side of an element will need to be overridden and switched, and any text-align attributes should be reversed. If you’ve never worked with non-Latin character sets before (Cyrillic, Greek, and a myriad of Asian and Indic), you might find that both your editor and browser do not display content as intended. Check that your editor and browser encodings are set to UTF-8 (recommended) and consider adding a element and the lang attribute of the html element to your HTML template so browsers know what to expect when rendering your page–this has the added benefit of ensuring that all Unicode characters are displayed correctly, so using HTML entities such as &eacute; (é) will not be necessary, saving valuable bytes! Check the W3C’s tutorial on character encoding if you’re having trouble–it contains in-depth explanations of the issues. Lastly, a practical tip on naming conventions when creating several language versions. Using a standard such as the ISO 639-1 language codes for naming helps when you start to deal with several language versions of the same document. Using a conventional standard will help users understand your site’s structure as well as making it more maintainable for all webmasters who might develop the site, and using the language codes for other site assets (logo images, PDF documents) is handy to be able to quickly identify files. See previous Webmaster Central posts for advice about URL structures and other issues surrounding working with multi-regional websites and working with multilingual websites. That’s a summary of the main challenges we wrestle with on a daily basis; but we can vouch for the fact that putting in the planning and work up front towards well-structured HTML and robust CSS pays dividends during localization! So you’re going global, and you need your website to follow. Should be a simple case of getting the text translated and you’re good to go, right? Probably not. The Google Webmaster Team frequently builds sites that are localized into over 40 languages, so here are some things that we take into account when launching our pages in both other languages and regions. have been growing tremendously over the last couple of years. It is inspiring and motivating for us to see how many users like you contribute to Google Forums. For some time, we´ve been thinking of ways to thank our Top Contributors -- our most the passionate, helpful, friendly, and active users. These TCs have demonstrated incredible commitment to our communities and continue to share their profound knowledge by answering user questions within the forums. TCs from all over the world will attend our first global summit in California. We decided to give the online world a break for a moment and meet in real life to celebrate our past success and work on future endeavours. Google Forum Guides, Googlers that participate in the forums, and Top Contributors will convene for the first global Top Contributor Summit on September 13th and 14th in Santa Clara and Mountain View, California. During the Google-organized two-day event, Top Contributors will meet guides, engineers and product managers in order to get to know each other, provide feedback and share new ideas. We’ll be sharing some of the insights and takeaways after the event too, so stay tuned. And if you would like to follow the events online, look out for the #TCsummit tag on Twitter and our updates on Google+. The communities around Google products and services have been growing tremendously over the last couple of years. It is inspiring and motivating for us to see how many users like you contribute to Google Forums. For some time, we´ve been thinking of ways to thank our Top Contributors -- our most the passionate, helpful, friendly, and active users. These TCs have demonstrated incredible commitment to our communities and continue to share their profound knowledge by answering user questions within the forums. A: Generally we can index textual content (written in any language) from PDF files that use various kinds of character encodings, provided they’re not password protected or encrypted. If the text is embedded as images, we may process the images with OCR algorithms to extract the text. The general rule of the thumb is that if you can copy and paste the text from a PDF document into a standard text document, we should be able to index that text. A: Currently the images are not indexed. In order for us to index your images, you should create HTML pages for them. To increase the likelihood of us returning your images in our search results, please read the tips in our Help Center. A: Generally links in PDF files are treated similarly to links in HTML: they can pass PageRank and other indexing signals, and we may follow them after we have crawled the PDF file. It’s currently not possible to "nofollow" links within a PDF document. A: Whenever possible, we recommend serving a single copy of your content. If this isn’t possible, make sure you indicate your preferred version by, for example, including the preferred URL in your Sitemap or by specifying the canonical version in the HTML or in the HTTP headers of the PDF resource. For more tips, read our Help Center article about canonicalization. If you want to learn more, watch Matt Cutt’s video about PDF files’ optimization for search, and visit our Help Center for information about the content types we’re able to index. If you have feedback or suggestions, please let us know in the Webmaster Help Forum. Our mission is to organize the world’s information and make it universally accessible and useful. During this ambitious quest, we sometimes encounter non-HTML files such as PDFs, spreadsheets, and presentations. Our algorithms don’t let different filetypes slow them down; we work hard to extract the relevant content and to index it appropriately for our search results. But how do we actually index these filetypes, and—since they often differ so much from standard HTML—what guidelines apply to these files? What if a webmaster doesn’t want us to index them?